Recent efforts to improve the outcomes of intensive care emphasize not only quality improvement at the local level but also better organization and management of health care systems at the regional and national level. 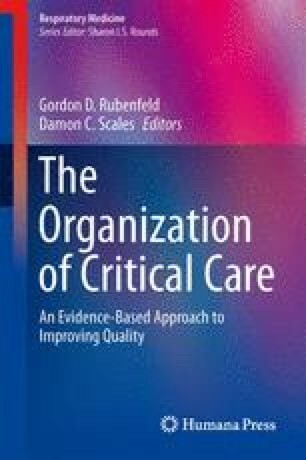 Central to this notion is the concept of regionalization, whereby selected critically ill patients are systematically triaged and transported to regional centers of excellence. Regionalization might improve quality and efficiency by improving access to scarce resources, increasing clinical experience in the care of complex patients, and creating economies of scale. At the same time, there are number of potential risks, including adverse events in the transport of critically ill patients, worsening of crowding at already overburdened referral ICUs, reducing clinical skill at referring hospitals, and creating a non-patient-centered system that values regional care at the expense of receiving care close to the patients’ homes. Future research and demonstration should provide insight into these tensions and lay the groundwork for regionalized critical care systems that are both effective and patient-centered.